I get asked this question ALL THE TIME! How do you stay ahead on blog posts? For over a year now I have usually been about a month ahead on having blog posts scheduled, 3 months ahead on having them planned out, and about 2 weeks ahead on photos if not more. I originally started this to be ahead on blog posts before Liam was born so I could take a bit of a maternity leave of sorts and still have content up. Then I just kept it up! But I wanted to share how to always stay ahead on blog posts so you never have to do any last minute stressing. Make An Editorial Calendar and Stick To It: So I don’t use ANYTHING fancy for mine. I literally use Google Docs. I always schedule my posts MWF and leave room TTH for sponsored content that may come up. I do move things around as needed. For example, if a sponsored post needs to be posted on a MWF or if I come up with something more time sensitive. So when I say stick to it there are exceptions. Keep A Running List: I keep a list in Google Drive of blog post ideas that I add into my editorial calendar as I see fit. Sometimes these ideas turn into other things. Somethings they are a phrase, quote, or sentence that later becomes a full blown post idea. At any given time I usually have 20-40 ideas on this list. This helps a lot when it comes to filling in the editorial calendar. Batch Take Photos For Your Blog and Instagram: Andrew takes all of my blog photos and does all of my graphics (yes I am SUPER lucky) and we take them all on weekends. Usually 1-2 weekends a month we spend several hours (hello both nap times) taking photos for the blog (sponsored and regular photos) and Instagram. Then we edit as needed. This helps a ton because we aren’t rushed and we don’t have to try to fit in taking pics during the week or at night. Write Evergreen Content: I try to write a ton of evergreen content (like this post)! Evergreen content is content that can be posted anytime and is always relevant! This helps for a few reasons. For one it will ALWAYS do well on Pinterest all year round. Two, it can be moved around an editorial calendar if it’s needed. Three, it will help your SEO a ton! Having evergreen content will also help you stay ahead on blog posts because it’s something you can easily write anytime and “stock up” on. 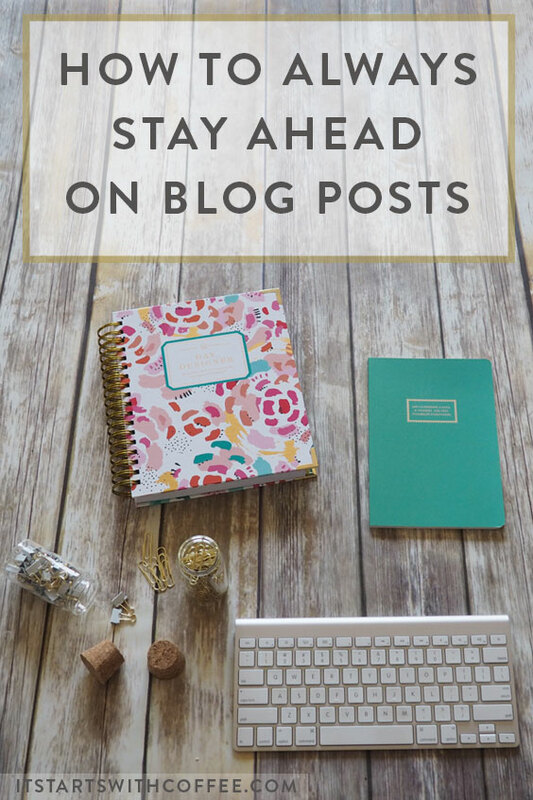 Are you someone who likes to stay ahead on blog posts? It is always a good thing to be working ahead. Personally, I am hoping to get there as well. I have not had time to do so quite yet. Working full time and having 3 kids as well as being the only one working on it makes that a little more difficult but not impossible I know. I have a terrible time coming up with ideas for posts. Once I have an idea I am good but getting there for me is hard. Great tips! I need to start doing batch photo shoots on the weekend. I find this to be one of the most time-consuming aspects of blogging. I use the Content Planner by Kat Gaskins. I like to see mine on paper. I also keep a list of ideas and I use the National Day Calendar to see if there are any days or months that I can use in my blog posts. I normally use stock photos so they are in a folder on my computer. I plan for the quarter so all my planning is done for the year. I do my Instagram by the month since it is mostly curated. Planning ahead does make blogging easier. My schedule at work always changes, so when I know I’m going to have time I have marathon blog days – days in which I write a bunch of blog posts all in the same day, complete with setting up SEO and working on graphics. Which is what I did yesterday! I need to start planning blog posts better. I am so on top of it for a month and then I go off the deep end ha! These tips definitely help though! This is the biggest biggest pain in my behind! I’m so good with scheduling but not with following through. Or maybe I plan too optimistically? Not sure…. but anyway this is my blogging goal! This is a timely read for me! I have been behind with blogging and feeling stressed about it. I realy need to use an editorial calendar and blog ahead and schedule posts. I have done that in the past and found it tremendously helpful. I also LOVE your idea of evergreen content! Love your tips, especially the batching! And I think having a good amount of evergreen content is necessary! All great tips. I really want to do better with writing and schedule ahead, as much as I can at least. I am one of those people that likes to stay ahead. When I am feeling creative and the words are flowing I just keep on writing! I do batch photos too. it saves so much time. I have a notepad on my phone I add blog post ideas to. Sometimes I get great ideas at weirdest times! I used to handle blogging like this all of the time and then I got sidetracked. I love that you shared these tips on how to always be ahead on blog posts because it was a nice reminder of how I used to handle blogging so I was always one step ahead. I will admit, the editorial calendar though is an area I am not really good at sticking with. I want to try to use one this year more often! I so need to be good about this. I keep an awesome calendar with more than 500 ideas, but am still always running behind (like today’s post written today…ugh!). I need to be better about evergreen content too. Thanks for the suggestions! This is so helpful, I have a huge list of post ideas and a content calendar scheduled a few months out but I find myself constantly falling behind! I think I need to be more realistic with my timeframes and dedicate a couple days to photo taking and editing as opposed to doing it post by post. Thanks for sharing! I have a draft in my posts of blog ideas for each theme. Lately, I’ve been able to be two days ahead of my posts and I would like to keep it up. It’s nice not trying to rush the night before finishing up a post to publish the next day. I like to write down ideas as I come up with them. That way, I always have a list so I’m not getting stuck with writer’s block. I most definitely do this! I get asked all the time how I managed to blog through medical school (and currently residency) too, and without my lists and batch-photos and editorial calendars, my blog would be a goner. I love this! I do need to start keeping my content calendar updated. I started taking my pictures on the weekend too and that helps a lot.